Samantha Martin didn’t want the title of Iblis and all the hellish responsibility that comes with it. She sure as heck didn’t want these feathery angel wings permanently affixed to her back– although those have their perks. She especially doesn’t want all the extra projects the Ruling Council keeps dumping on her plate. Tricked into protecting a pregnant woman, Sam discovers that her hasty vow came with a whole lot of strings attached—strings that make her question her trust in Gregory. In order to keep her promises, she’ll need to rely on old friends as well as a house full of unlikely allies. 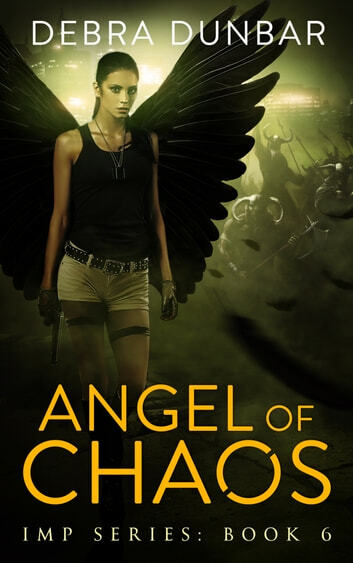 As if that weren’t enough chaos for an imp, the angels finally find proof that werewolves are Nephilim—the descendants of fallen angels. An entire race is facing extinction and their only hope for salvation is an angel from Hel. This was a cute story. It didn't have as much action as previous books in the series but it was still a good read. Dunbar never disappoints. She has me reading way past bedtime and frequently laughing hysterically.